We love our beef at my house...especially when it's really good-quality beef! I recently received a sampler of 100% fullblood Wagyu beef from Lone Mountain Wagyu to try in my kitchen. All it took was one bite, and we knew that their beef was something special! Lone Mountain Wagyu beef is all natural, pasture raised gourmet beef. Their Wagyu beef is highly marbled, so the end result is juicy and flavorful -- and extremely tender. Lone Mountain Wagyu is a family owned and operated ranch located in New Mexico that follows traditional Japanese methods to raise its beef. They're one of only a few U.S. ranches that raises authentic 100% fullblood Wagyu beef. Wagyu is a Japanese cattle breed that have the same genetics as Kobe beef -- making it highly marbled and supremely tender. Lone Mountain is proud to say that the quality of their Wagyu beef is Beyond Prime beef. I received a sampler pack that contained Wagyu skirt steak, ground beef, and sausage links. The first item we tried was the skirt steak, which we grilled for a family dinner. Everyone oohed and ahhed as we tasted the Wagyu. It had a rich beefy taste, and it was so tender and juicy. There were five us at the table that night, and we all raved about the Lone Mountain Wagyu! For the ground beef, I wanted to create a recipe worthy of the Wagyu's juicy goodness. I created my Giant Mozzarella-Stuffed Wagyu Meatballs. The meatballs are flavored with Italian seasonings and spices, wrapped around large cubes of fresh mozzarella, then baked in the oven. 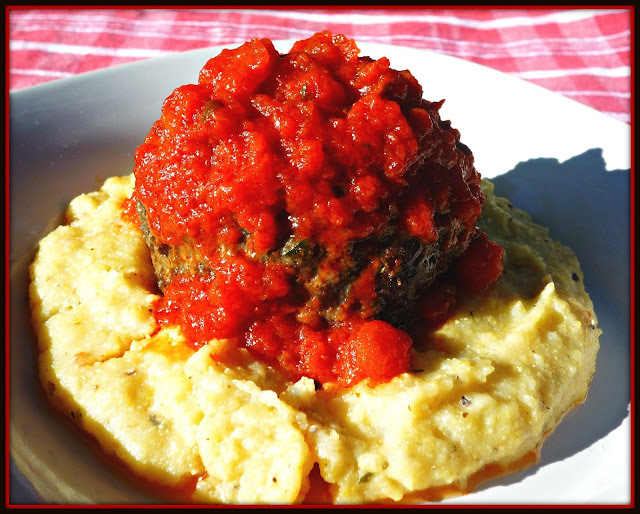 I served each single-serving meatball on a bed of creamy polenta topped with a San Marzano tomato sauce. 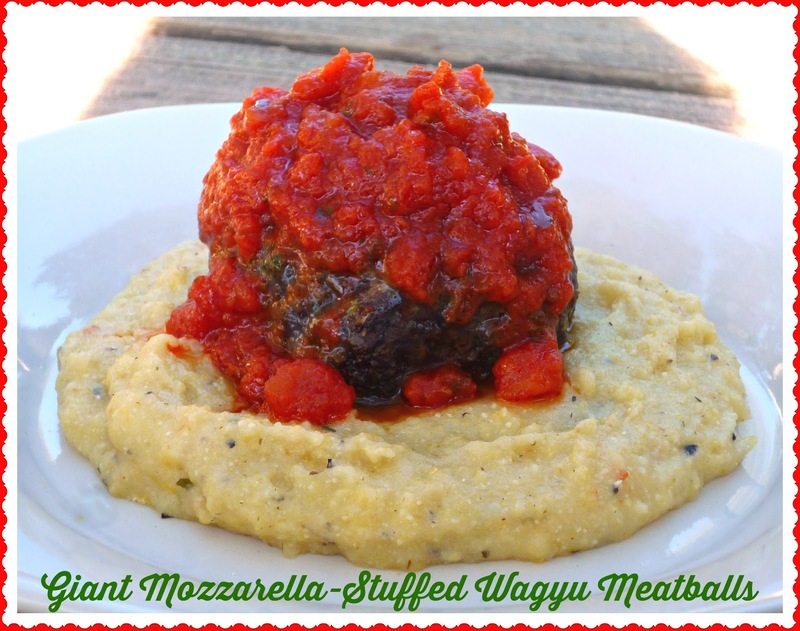 These meatballs are indeed special -- beefy and full of flavor! Step 1: Add the ground Wagyu beef, egg, panko, garlic, basil, shallot, Italian seasoning, parmesan cheese, and salt & pepper to a large bowl. Using pristinely clean hands, combine all of the ingredients just until they are combined. Spread the meat mixture evenly in the bottom of the bowl. Using your hands, divide into four sections -- this ensures the meatballs are the same size. Step 2: Preheat oven to 375 and place a rack on top of a large rimmed baking shape. 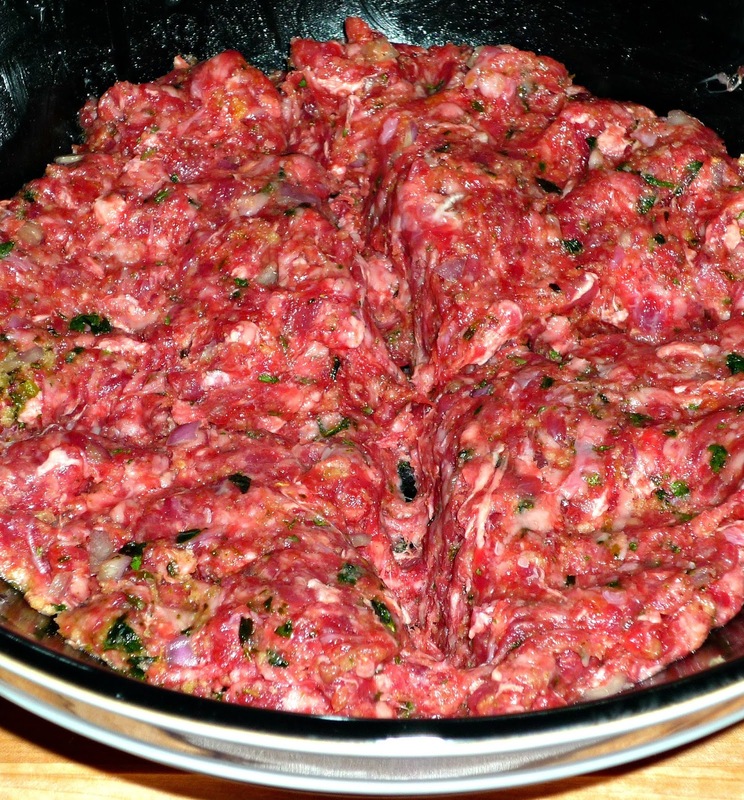 Shape one quarter of the meatball mixture into a thin round patty. Place one of the cubes of fresh mozzarella in the center of the patty and wrap the meatball mixture around the cheese. 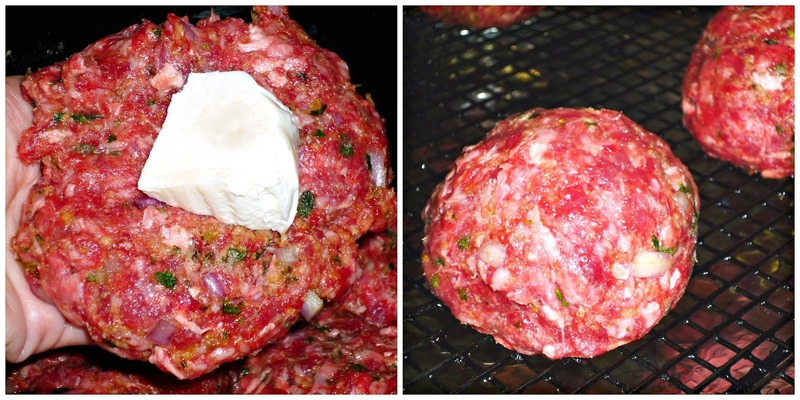 Roll the meatball into a ball, completely enclosing the cheese. Repeat with the rest of the meatball mixture and the mozzarella cubes. Place the four meatballs on the baking rack. Step 3: Bake the meatballs until they are browned on the outside and cooked through -- approximately 20 minutes. Turn the pan around halfway through the baking time to ensure even cooking. Don't panic if a bit of the cheese oozes out during the baking process! To served, place one meatball on top of creamy polenta or pasta. Top each meatball with 1/2 cup of your favorite tomato sauce. If desired, sprinkle with a bit more grated parmesan cheese. 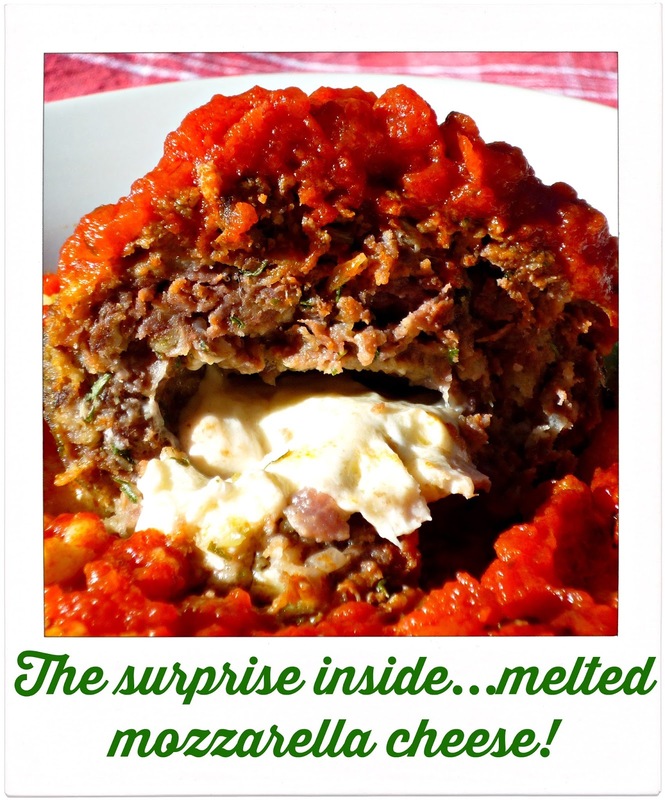 It's really fun to see the look on everyone's face when they cut into the giant meatball to find a core of melted mozzarella! These meatballs are amazing -- juicy, flavorful, and bursting with melted cheese! The Lone Mountain Wagyu beef provided a juicy texture and robust beef flavor. We especially loved how well these meatballs paired with the soft creamy polenta, but you could also serve over mashed potatoes or pasta. These meatballs can be on the table in less than an hour on a busy weeknight, but they're definitely fancy enough to serve company. 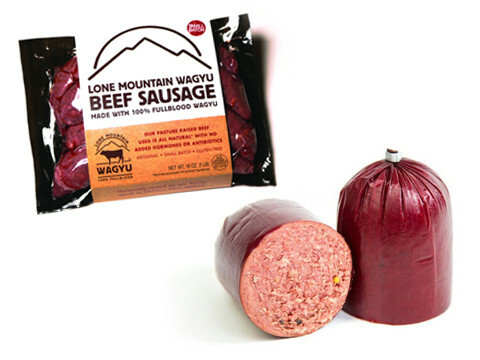 Just in time for the upcoming holiday entertaining season, Lone Mountain Wagyu is going to give one lucky reader of The Weekend Gourmet one of their Sausage Combo Packs (retail value: $70) to try out in their kitchen! This sausage prize pack contains two packages of their Wagyu Beef Sausage links and two 1-lb. packages of Wagyu Summer Sausage. 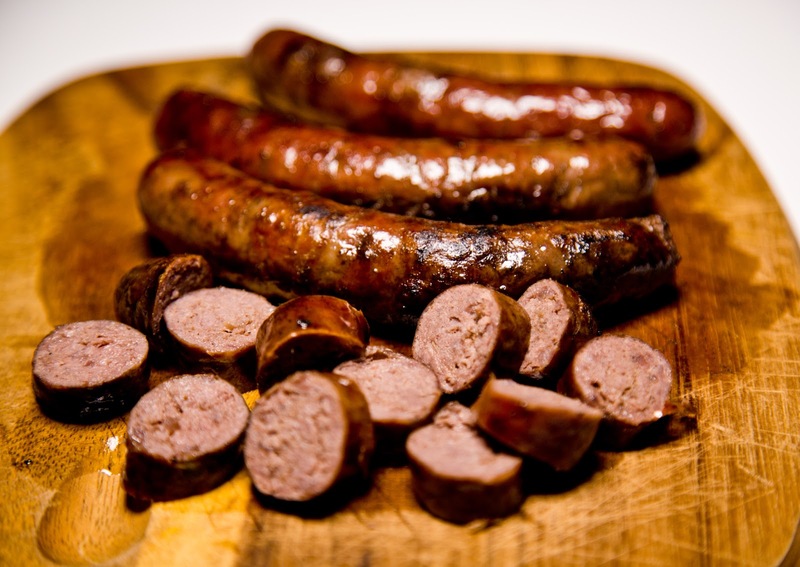 Both types of sausage are gluten free and are made from a proprietary blend of Wagyu filet mignon, striploin, ribeye, flat iron, brisket, and ground beef. The lightly spicy beef sausage links grill up perfectly, and they are so juicy. They can be eaten as is or sliced and added to casseroles or pasta dishes. The Summer Sausage would be a wonderful addition to your holiday cheese platters! To enter this giveaway, simply follow the instructions that are in the Rafflecopter below. I'll accept entries until 1159 p.m. CST on Sunday, November 29th. The winner will be notified via e-mail on Monday, November 30th. Good luck! Disclosure: Lone Mountain Wagyu sent me a sampler of their beef products to facilitate recipe development and this giveaway. All opinions expressed are solely my own.